In states that offer simplified divorce for persons without kids and assets, the couple can generally file a joint petition with the court. In other words, both parties will collaboratively prepare and sign the petition, assenting to the dissolution of marriage. Generally, this is only for marriages of short-term duration, and the couple might have to waive alimony claims and rights to a trial.This petition will generally stipulate that they do not have significant assets or debts, and explicitly state that no children were born or adopted during the marriage. Further, a simplified divorce petition will list basic information about the couple -- including their names, dates of birth, date of marriage and grounds under which they are seeking divorce. 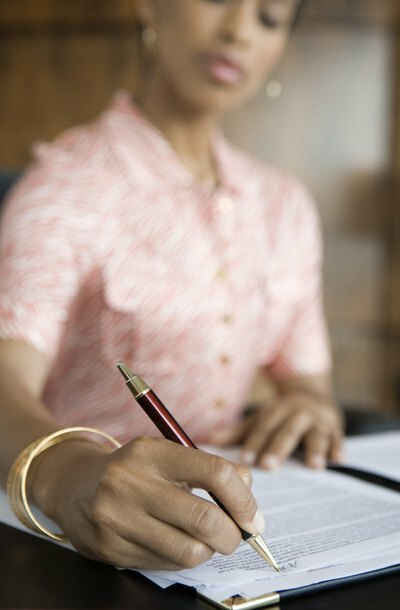 Although divorce laws vary from state to state, couples filing for divorce who do not have assets or children may be required to submit additional paperwork with their petition. This extra paperwork may include financial declarations that discuss the couple’s income and debts. Likewise, state law may require the couple to provide waivers of service, which attest the couple prepared the petition jointly. In many instances, the court will require a couple to submit a separate settlement agreement, along with their simplified divorce petition. In states that do not require couples to file a settlement agreement at the time they file the petition, the court will generally require the parties to prepare one before finalizing the divorce. This settlement agreement will simply outline the terms of the divorce, and the agreement typically needs to include statements about division of the couple’s joint marital property -- even if the property is not of significant value, as well as statements about how the couple will dispose of any joint debts. In some states, having neither children nor assets may qualify a couple for a simplified divorce. However, courts may consider only two factors when determining whether a couple qualifies for a simplified divorce process. For example, even without children or assets, a couple may not be able to file for a simplified divorce if their income is over a state-specified amount or one party is seeking alimony. Likewise, couples with significant joint debts or who have had a long marriage may not qualify for simplified divorce, explains Chicago Volunteer Legal Services. Further, if either party is contesting the divorce or the court must hold a trial to resolve outstanding issues, the court will likely deny any request for a simplified divorce.